Addison HSS Ground Thread Hand Taps 10 x 0.75mmDescription :Taps and dies are tools used to create screw threads, which is called threading. Many are cutting tools; others are forming tools. A tap is used to cut or form ..
Addison HSS Ground Thread Hand Taps 10 x 1.0mmDescription :Taps and dies are tools used to create screw threads, which is called threading. Many are cutting tools; others are forming tools. A tap is used to cut or form t..
Addison HSS Ground Thread Hand Taps 10 x 1.25mmDescription :Taps and dies are tools used to create screw threads, which is called threading. Many are cutting tools; others are forming tools. A tap is used to cut or form ..
Addison HSS Ground Thread Hand Taps 11 x 1.0mmDescription :Taps and dies are tools used to create screw threads, which is called threading. Many are cutting tools; others are forming tools. A tap is used to cut or form t..
Addison HSS Ground Thread Hand Taps 12 x 1.0mmDescription :Taps and dies are tools used to create screw threads, which is called threading. Many are cutting tools; others are forming tools. A tap is used to cut or form t..
Addison HSS Ground Thread Hand Taps 12 x 1.25mmDescription :Taps and dies are tools used to create screw threads, which is called threading. Many are cutting tools; others are forming tools. 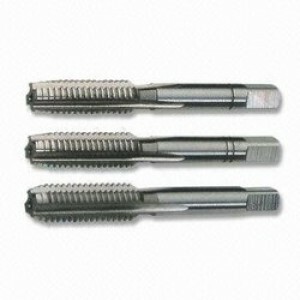 A tap is used to cut or form ..
Addison HSS Ground Thread Hand Taps 12 x 1.5mmDescription :Taps and dies are tools used to create screw threads, which is called threading. Many are cutting tools; others are forming tools. A tap is used to cut or form t..
Addison HSS Ground Thread Hand Taps 14 x 1.0mmDescription :Taps and dies are tools used to create screw threads, which is called threading. Many are cutting tools; others are forming tools. A tap is used to cut or form t..
Addison HSS Ground Thread Hand Taps 14 x 1.25mmDescription :Taps and dies are tools used to create screw threads, which is called threading. Many are cutting tools; others are forming tools. A tap is used to cut or form ..
Addison HSS Ground Thread Hand Taps 14 x 1.5mmDescription :Taps and dies are tools used to create screw threads, which is called threading. Many are cutting tools; others are forming tools. A tap is used to cut or form t..
Addison HSS Ground Thread Hand Taps 15 x 1.0mmDescription :Taps and dies are tools used to create screw threads, which is called threading. Many are cutting tools; others are forming tools. A tap is used to cut or form t..
Addison HSS Ground Thread Hand Taps 15 x 1.5mmDescription :Taps and dies are tools used to create screw threads, which is called threading. Many are cutting tools; others are forming tools. A tap is used to cut or form t..
Addison HSS Ground Thread Hand Taps 16 x 1.5mmDescription :Taps and dies are tools used to create screw threads, which is called threading. Many are cutting tools; others are forming tools. A tap is used to cut or form t..
Addison HSS Ground Thread Hand Taps 18 x 1.0mmDescription :Taps and dies are tools used to create screw threads, which is called threading. Many are cutting tools; others are forming tools. A tap is used to cut or form t..
Addison HSS Ground Thread Hand Taps 18 x 1.5mmDescription :Taps and dies are tools used to create screw threads, which is called threading. Many are cutting tools; others are forming tools. A tap is used to cut or form t..